A career that creates wealth and keeps you healthy... With people keen to lose weight and get in shape, fitness training is one of the fastest growing careers in the health and fitness industry today. Fitness is not only a lucrative career it can be termed as a sustainable business too. Careers in fitness industry include that of Athletic Trainer, Physical Therapist, Massage Therapist, Fitness Instructor/Trainer and so on. In this section we can go in detail about the career as a Fitness Instructor/Trainer. If you love sports, physical activity and exercise, and want to combine your passion for fitness with your career, you are the right person for a career as Fitness Trainer. Fitness Trainers are known by different names- Aerobics instructor, Clinical exercise specialist, Gym instructor, Personal and Corporate trainers. Fitness Trainer is a person who looks after the issues concerning the health and physical fitness of his/her clients. A fitness instructor or a personal trainer's main job is to train people in the various aspects of physical fitness and maintain health by staying fit. Fitness Trainer plan the exercise regimen, by considering the age, lifestyle, health problems and other constraints of the person opting for the training program. They also give them basic advice on health and nutrition. They assess the fitness level of clients and also help to set fitness goals and demonstrate the various routines and give guidance to do it the right way. Fitness trainers/instructors opt various exercise routines such as weightlifting, aerobics, karate, kickboxing, spin cycling, yoga, pilates etc. They can also specialize in any one of these and become a specialist trainer. Fitness trainer works one-on-one in case of personal training, works for a group of people in fitness centers, health clubs or gym etc. Fitness training can be divided into three major sub-categories: Group Fitness Instructors, Exercise Specialists and Personal Trainers. 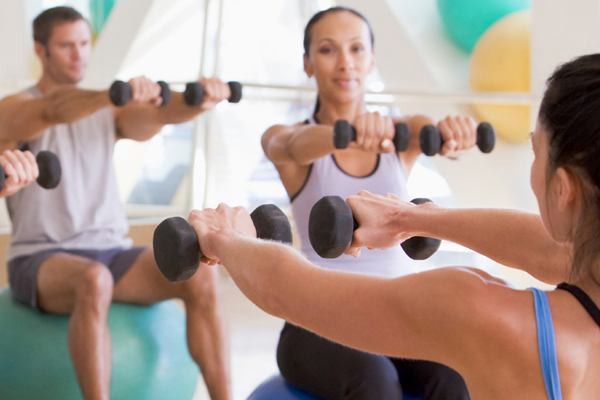 People who teach any form of exercise in a group/classroom setting are referred to as group fitness instructors. Exercise Specialists work with people suffering from specific physical ailments. They design the appropriate exercise programme for a patient in accordance with a physician's recommendations. Personal Trainers are instructors who supervise the exercise and workouts on a one-to-one basis with celebrities and others who like privacy. Today people from all walks of life- from celebrities to senior citizens are seeking personal trainers to help them learn how to exercise, lose weight, maintain all round fitness and adopt a healthier lifestyle. Hence, to be a Fitness trainer is a career with numerous opportunities. Basically, one can start off by learning various nuances of fitness right from their local gym. But as the demand for qualified instructors multiply, those with professional degree is most preferred for this job. The options for pursuing professional courses are many. You can opt for a certificate or diploma course in sports science/yoga/fitness/naturopathy to become a fitness instructor. One can go for a professional course like the Nike Aerobics Course or Reebok Instructor Certification programme or any of the several reputed locally offered courses like those at Talwalkar's in Mumbai. Diploma or Bachelor courses in Yoga & Naturopathy courses can also be taken by an instructor. The Sports Authority of India (SAI), Lakshmibai National Institute of Physical Education are prominent institutes that offers courses in Sports & Athletics Coaching. This is not the job meant for those who love to sit and work from 10 to 5. A trainer can never sit on the bench and guide others. Those who opt this career must be energetic and have a lot of stamina. A good physique and determination is the main requirement in the field. Fitness trainer must have a good knowledge of human anatomy, diet, nutrition and other health and fitness related matters. He /she must have the motivation to be healthy and fit and encourage others to do the same. Trainers also need good communication and interpersonal skills, as they have to deal with all kinds of people. In addition to this, patience, dedication, strong analytical skills, and calm attitude are also required to excel in this field. As a fitness instructor you will also need to keep abreast of the latest developments in health science. Apart from this, a fitness trainer should ensure safety while instructing clients. People getting more conscious about health and appearance has resulted in the mushrooming of gyms and health clubs in the recent past. As such the demand for qualified instructors is going up sharply. Fitness trainers can work as health club managers, fitness directors, aerobics instructors, corporate wellness directors, personal trainers, weight loss counselors etc. After finishing the course one can start a career in this field by assisting a senior fitness instructor and once you gain some experience, can start taking your own classes or become a personal instructor. Fitness trainers are generally employed by hotels, health clubs, gyms, fitness centres, spas, tourist resorts, housing societies and large organizations. You can specialize in any of the following - weightlifting, aerobics, karate, kickboxing, spin cycling, yoga, spinning, and work as a fitness trainer. One of the best options in this field is to set up your own fitness centre. However, this requires meticulous planning, financial support and excellent management skills. Once you have acquired a reputation, you could conduct fitness programmes or health shows on popular TV channels. Another lucrative option today is to organise workplace wellness and fitness programmes for large companies. The affluent are also keen on setting up gymnasiums at home, creating additional job opportunities for personal trainers. Another option is that of a celebrity trainer. You can work exclusively as a personal fitness trainer for some celebrity. In addition to actual training, one can also earn by conducting various guest sessions for corporate houses and writing articles related to fitness in health journals/magazines. Pay scale in this field is mainly based upon the reputation of the centre, the locality in which the fitness club is located, the clientele, number of students etc. As a beginner one can earn a salary between Rs 5000- Rs7000 per month. Established trainers charge up to Rs.1,000-1,500 per hour. Personal trainers are very much in demand these days. They earn a lot more than the Group Fitness Instructors and Exercise Specialists. If you are a celebrity trainer you can earn much more. They are the most highly paid category. With the popularity and need of fitness trainer, many institutions are now conducting specialized training programs. Some of the prominent ones are institutions under Sports Authority of India (SAI), Indira Gandhi Institute of Physical Education & Sports Sciences (New Delhi), Lakshmibai National College of Physical Education (Kerala), Netaji Subhash National Institute of Sports (Punjab) and HVPM (Amravati).